First Blog of Spring Semester! 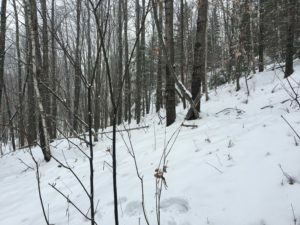 A spot that I decided to use for the comparison to my site in the Burlington Intervale was the summit of Mount Kinsman, North Peak. This peak is part of the Cannon-Kinsman Ridge within the White Mountains of New Hampshire. 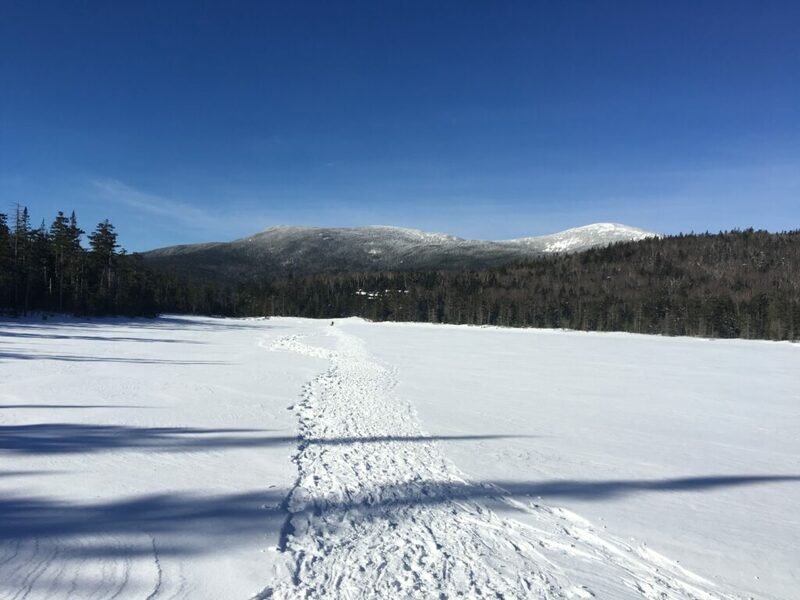 The ridge runs north from Kinsman Notch to Echo Lake and Profile Lake the source of the Pemigewasset River in Franconia. 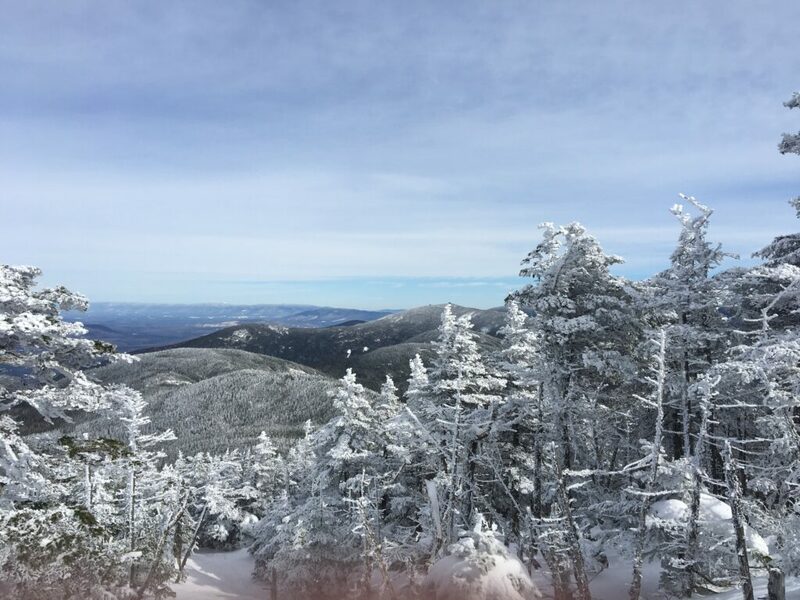 The ridge is approximately 20 miles long and forms the west side of the Franconia Notch. North Kinsman at 4293 vertical feet tall is a pyramidal shaped peak with a summit just below treeline. This is part of the montane black spruce and balsam fir forest ecosystem which is the closed canopy forest layer at the highest elevation gradient in the White Mountains. Common bird species include the grey jay, the black-throated sparrow and chickadees. Common animals include snowshoe hair, red squirrels, and other species. This location is very different from my phenology site at the elevation is 3500 feet higher with a complex montane ecosystem compared to a floodplain forest. 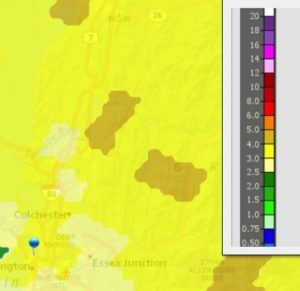 The differing mountain ecological layers in New Hampshire are roughly 300-500 feet higher than in Vermont with the alpine zone not occurring until 4200-4800 feet. 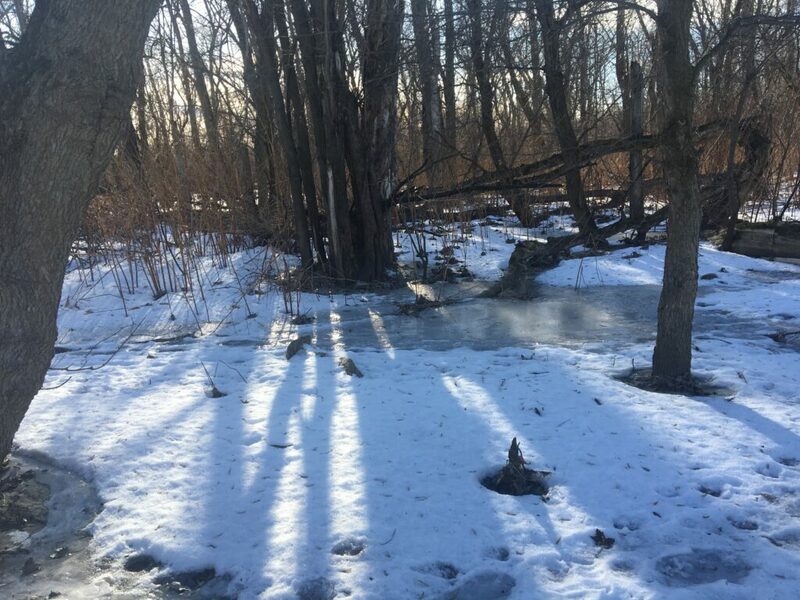 The conditions on the walk into my site were markedly improved from my last trip where it was a solid sheet of ice. The conditions were a dusting of light powder that was from a snowstorm that stopped during the walk in covering a couple inches of hard crunchy snow with a bottom layer of ice for a total cover of 3-4 inches. The top photos are from this visit, the bottom images are from the previous visit. All trees are in good conditions with no indication of blowdowns or broken branches. 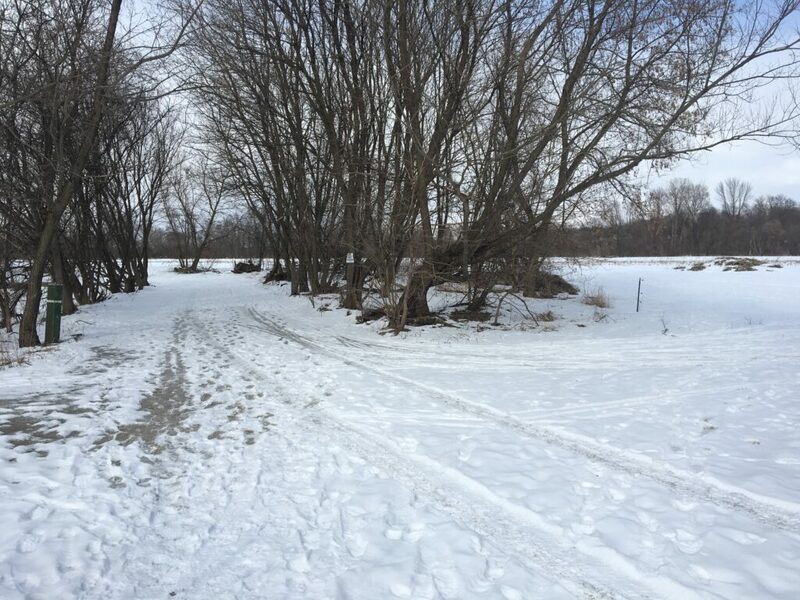 The river had a dusting of snow on top of the ice and was about 6 feet below the floodplain level. There was a different climate on the other side of the river as the fields let in more sunlight which results in snowmelt. 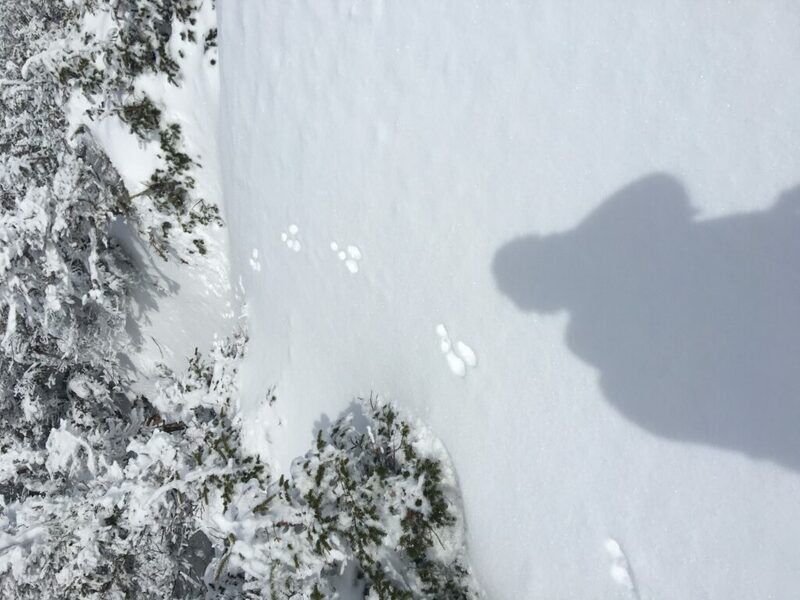 Some tracks that I found at my site are gray fox and red squirrel. 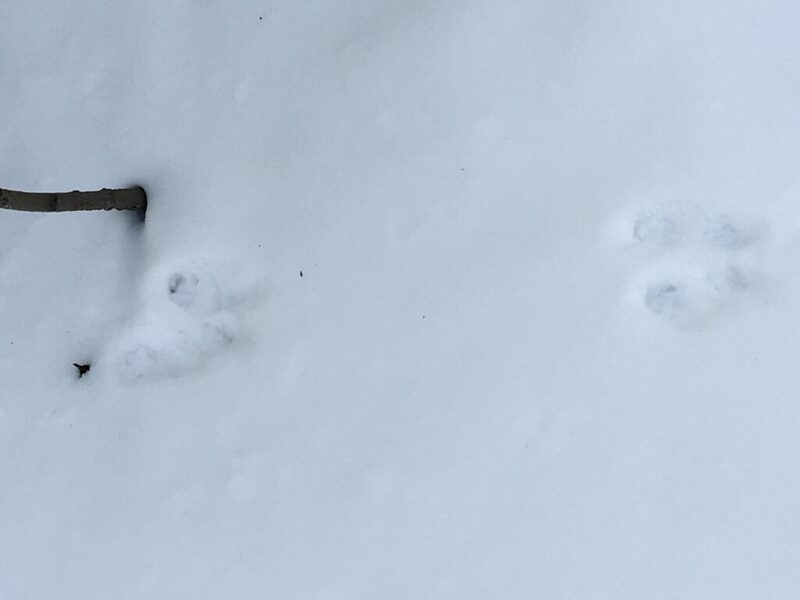 This seems to be a trail that has been used multiple times by the same animal. It has a direct register with a track stride of 34cm and straddle of 5-10cm as the multiple track sets made this hard to determine. The track length is 5-6 cm long by 5-6cm wide. The track has 4 toes, claws, and a X mark in the negative relief. 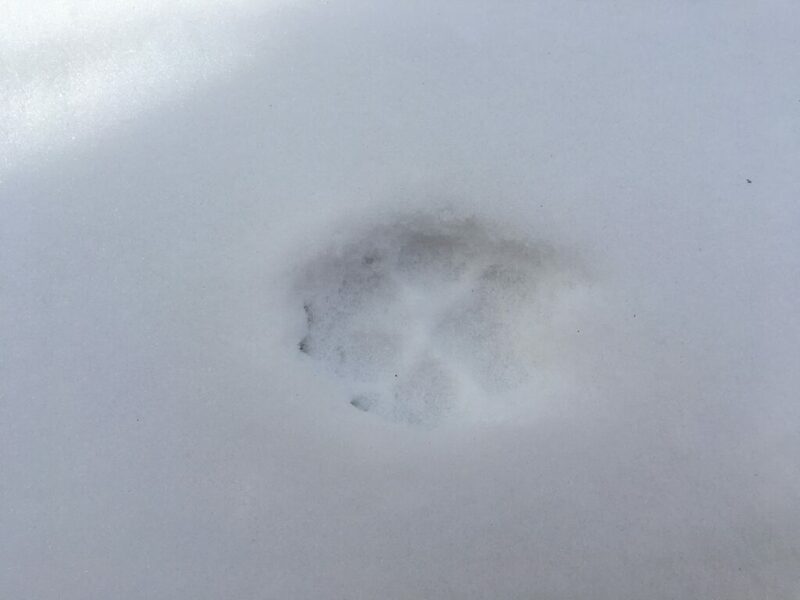 The only two animals with a track of this profile are the Red Fox and Gray Fox and the tracks are a Grey Fox due to the shape of the heel pad. This next track goes to a sugar maple (acer rubrum) which is about a foot outside the of the photo. The track is a hopper/galloper and has a stride of 45cm and a straddle of 4cm for the hind foot and a straddle of 1cm for the front foot. Based upon the track size, this is a red squirrel track. The next post will focus upon a different location that I explore during break and likely somewhere at a higher elevation in the White Mountains of New Hampshire. 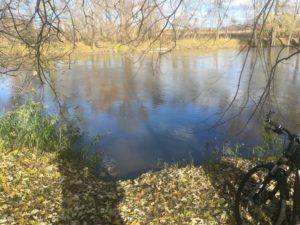 So, I visited my site on Sunday to snag some photos of the conditions from the previous week when my phone died and I couldn’t get any pictures. 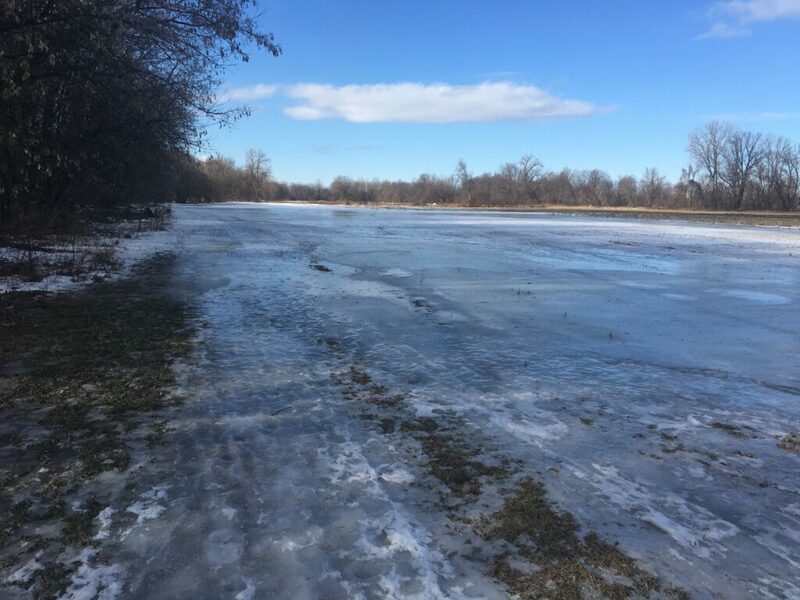 The conditions were the same with a lot of ice and some snow on the ground, the river completely iced over and terrible tracking conditions. 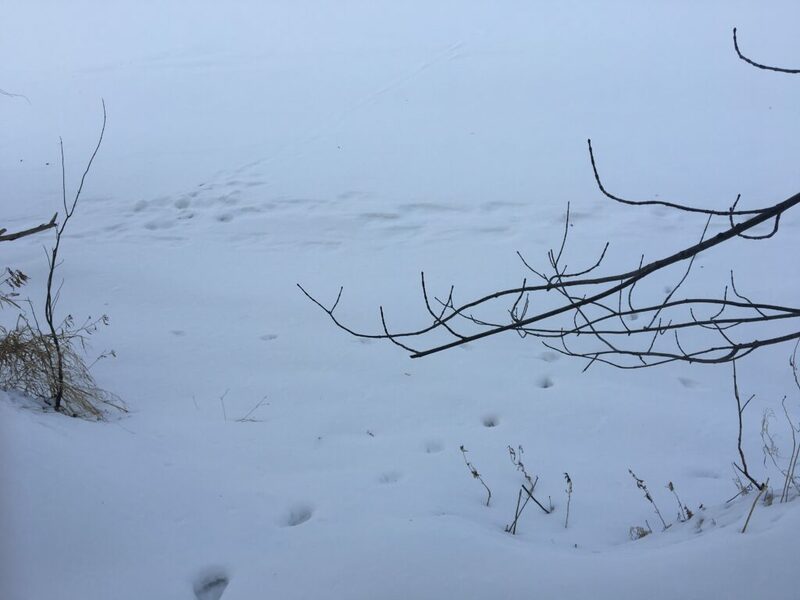 These two photos show how treacherously icy the Intervale road and surrounding fields were with sheets of ice, some patches of snow, and some exposed ground. 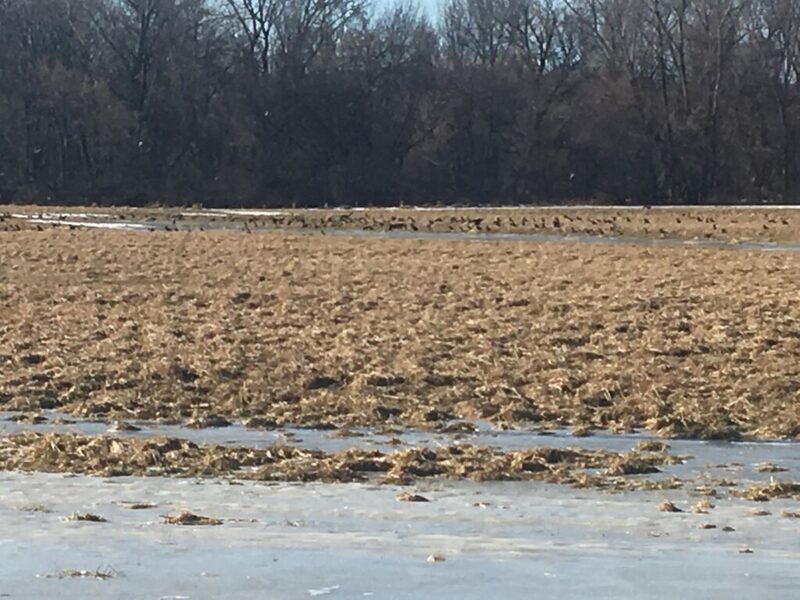 This was the only wildlife sighting of a farm field occupied by a large flock of crows. 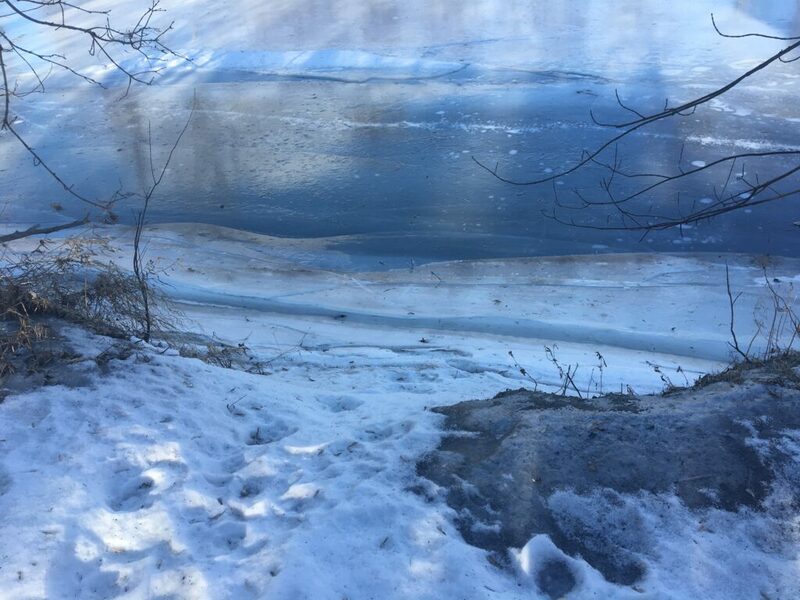 The river ice was cracking on the near bank and it was just terrible, terrible tracking conditions. Fortunately, I made it to my site and back without falling, a total of 2.5 miles along the road and in the fields. 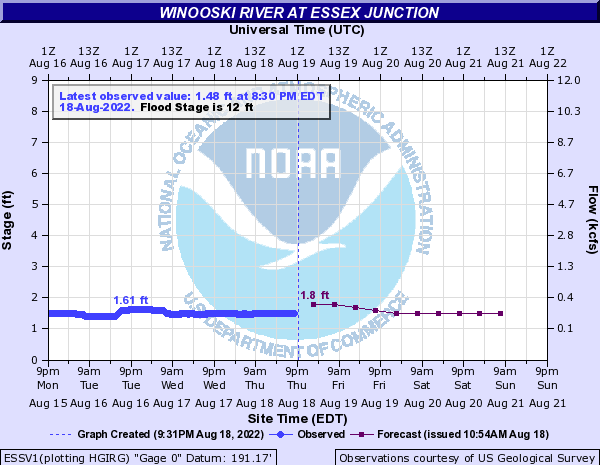 Unfortunately, my phone died on my way to my site so this will be a sketch heavy blog post supplemented with hydrograph information from the Winooski River at Essex Junction hydrological station. 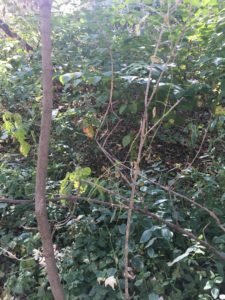 This is a link to my sketches of a sugar maple, a boxelder, and an american elm; from my site map one can see that these are common tree species at my site. 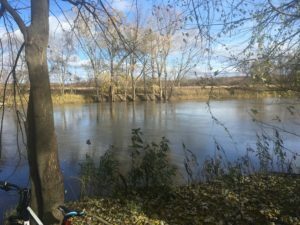 Based upon the recent weather pattern of cold temperatures and low precipitation, we can see that the river is relatively low which combined with the mixed precipitation and rain from the last 24 hours has exposed part of the riverbank which combined with the melted snowpack has resulted in poor tracking conditions. 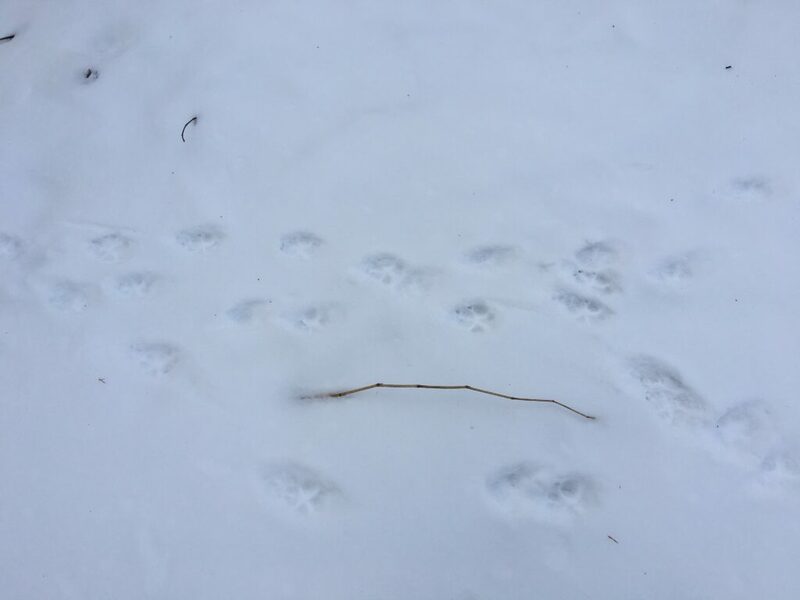 This had made it so that there isn’t a clear idea of which species have visited my site; however, I hope that better snowpack conditions during my next site visit will make it so that I can clearly identify some of the species which have visited my site. 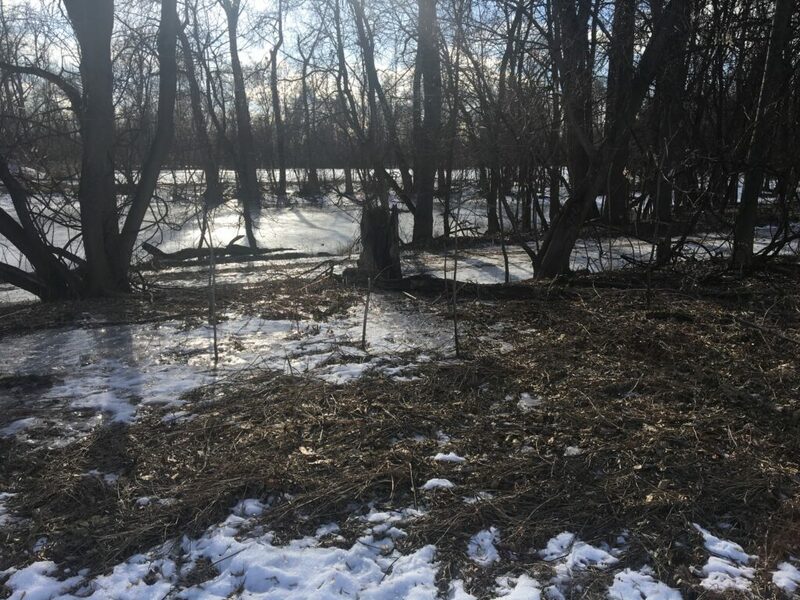 These two photos show the forest conditions and river level that were at my site when I visited it, these aren’t photos from my site visit, but are references to explain site observations. 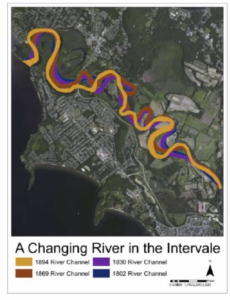 This short slideshow shows the impacts of 19th century land usage upon the Winooski River within Burlington Intervale. 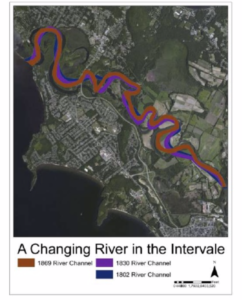 According to Burlington Geographic, “the course of the Winooski through the Intervale shifted dramatically—600-1000’—over only 80 years.” This was a result of the deforestation and agricultural practices which caused increased surface runoff and flooding which resulted in the deposition of sediment along the Burlington Intervale and within the Winooski River Delta. 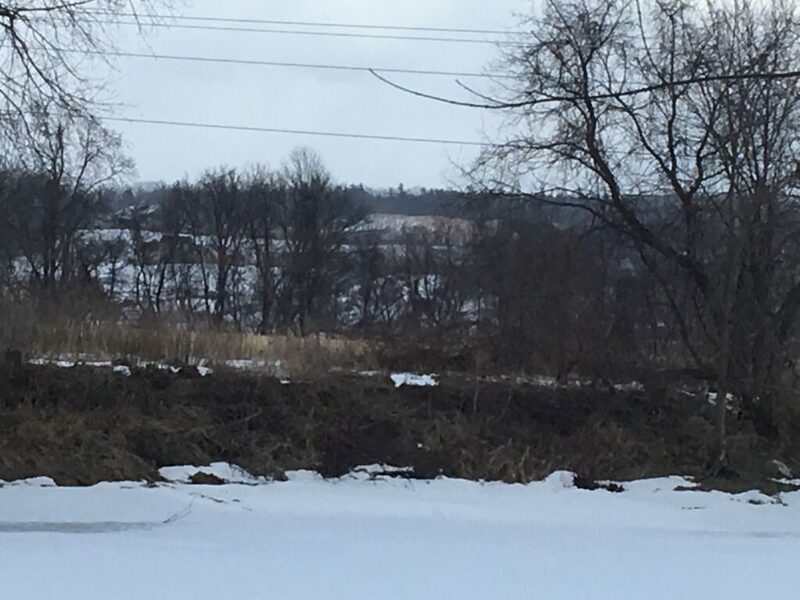 In the 1980’s a shift towards organic farming within the Intervale started, this results in the current farming community within the Intervale. Photo below is from source listed below. As a result of the semester ending, this is my last post until next January. I am saddened to miss a whole month of potential observations, but am excited to see the site in winter conditions when I return. 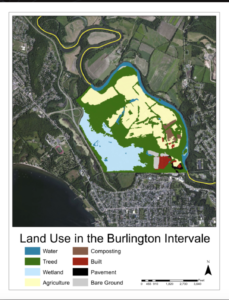 I hope all that followed or read my posts enjoyed my site and will want to explore Burlington Intervale as a result of my posts. This is an area with rich cultural and natural history and a place that I am happy that I picked for a phenology site. The location where I compared my phenology spot to is a secondary succession forest regrown from former agricultural land and logging. The terrain is hilly with flat ground from the land usage as plowed agricultural fields. 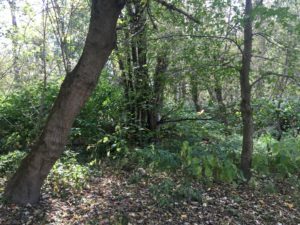 The top photos show some of the land usage features of the land including barbed wire fencing, boundary marker trees, and an old road; there is a nearby stonewall that I couldn’t locate for a picture. The bottom photos show the forest composition which is explained in detail below. The link below is for a mymaps that shows the locations of my normal spot and the spot of comparison: https://www.google.com/maps/d/u/0/edit?mid=1LHkXgX_ek8lc5t64KuJk8AWISMwhXi72&ll=44.39480683496581%2C-71.97312903240282&z=17. This place with its rolling hills and flat benches each staggered at an elevation higher than the previous is one with wonder of its past as farmland. The old barbed wire and stonewall fences, the old grownup roads, the hidden boundary markers are wrinkles upon the body of this land which once oozed with a youthful vibrance from the activity of its former farming days. 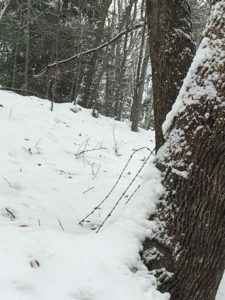 The land has a young forest of American beech, striped maple, paper birch, poplar, yellow birch, red oak, red spruce, balsam fir from which the reverberating sound of a pileated woodpecker drilling into a tree is often heard. 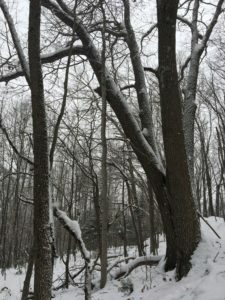 This section of the forest with abundant snags is great habitat for these pileated woodpeckers; comparatively the small area of mature hardwood forest high on the shoulder of the hill is much quieter. 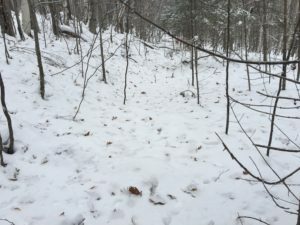 The tracks in both locations ask for wonder what animals where here and later excitement at listening to and attempting to call in a grunting buck and in a verbal exchange of calls with an alarmed crow. If the snow was less crunchy maybe the birds and deer would be easier to sneak up upon, alas that wasn’t the case. 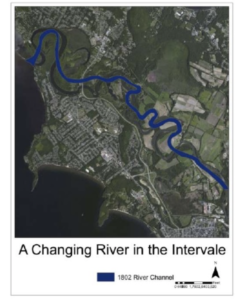 Two drastically different places one a typical forested lowland area now with a high river that alas has taken the ability to use the riverbank sandy soil as a source of great tracking information. The other place, a normal post-agriculture forest where the forest has retaken land boldly cleared by the farmer only to let in return to its former state. 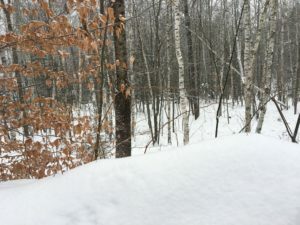 This place is a vibrant forest, great for hunting with a layer of snow that makes tracking easy even for the lazy man, a hunter unmotivated to understand the forest for its signs of wildlife. The rub trees, the nibbled browse, the animal beds, the acorn tops, the woodpecker holes, these signs of wildlife this man not in touch with this forest will miss for he covers his incompetencies by burying his nose in the ground and blindly following the various tracks. But enough about others for I observe that the first place is significantly different than the second and that each place holds different animals and vegetation and that these lack of similarities between the places from their species and history makes these places have different values and importance. 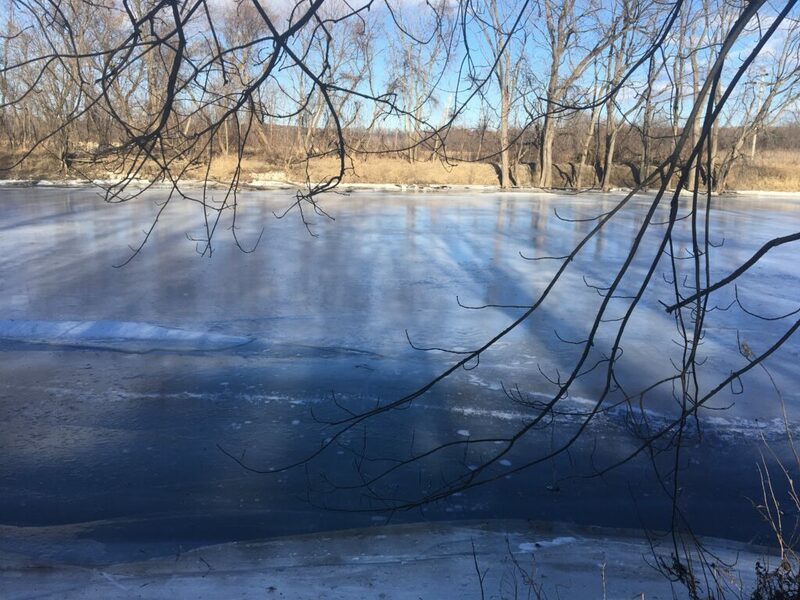 There were some significant changes to my phenology site since my last visit almost three weeks ago relating to the water level. 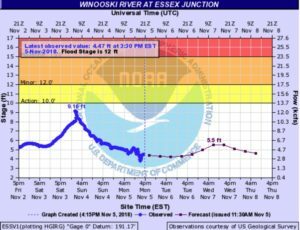 Based upon a National Weather Service hydrograph, this change in water levels is the result of a peak discharge event during Saturday night and early Sunday morning which resulted in the Winooski river reaching near the action state. 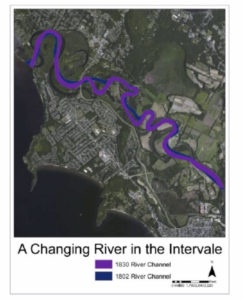 A possible cause of this increase in the water level could have to do with the surrounding area having recorded precipitation levels of 3-5 inches within the last 14 days within the nearby portions of the watershed. 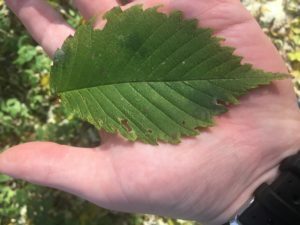 Upon closer examination, I am wondering whether the trees that I previously labeled as American Beech (fagus grandifolia) might actually be a member of the chestnut family; the leaves are pretty beat up so it’s hard to tell from the photo. 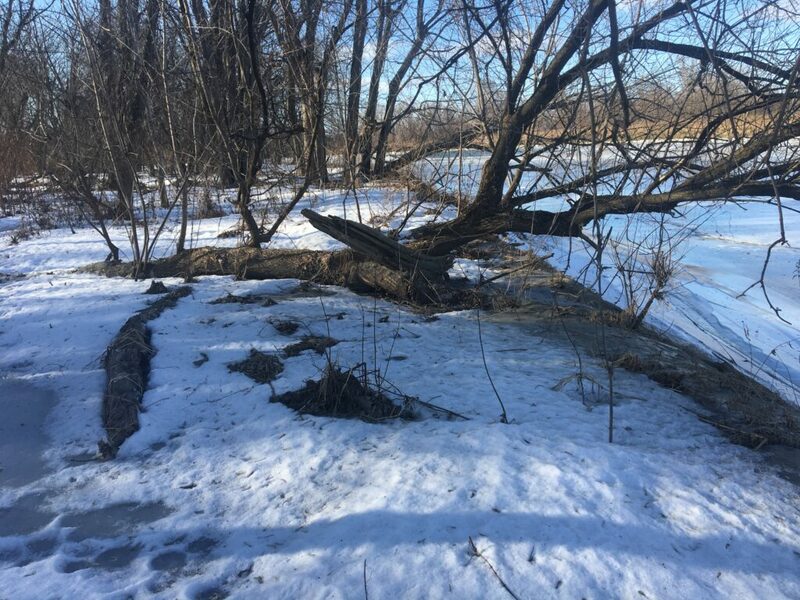 Also the green ash and sugar maple trees have lost most of their leaves and there was some erosion at the edge of the riverbank. Farewell, my next update will be posted in about two weeks. Visit on October 16th, was seasonably cold, mostly sunny, strong gusty winds. 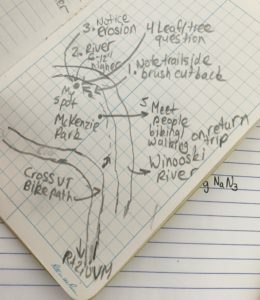 The top three pictures are examples of the forest composition of the site which is an edge habitat on west side of the Winooski River. From my first visit I missed several trees when doing the forest composition. I located 4 Boxelder, 2 Sugar Maple, and 5 Green Ash that were in my area. 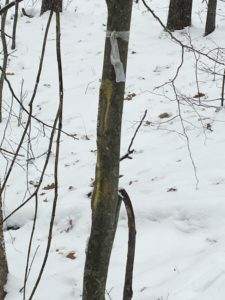 The next set of photos are examples of impacts of species upon the different trees. 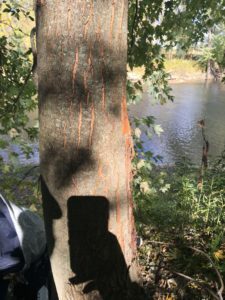 In the photo on the left there are marks on a Sugar Maple in about the middle of the tree that could either be claw marks or cracks in the bark. 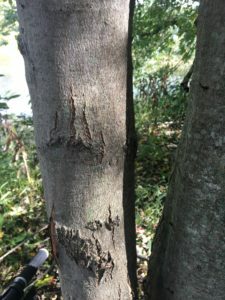 The second photo of the tree from a different angle makes it look like cracks in the bark. 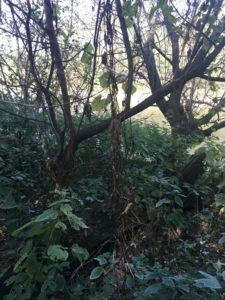 The next two photos are examples of the impacts of invasive species as they show Green Ash and Boxelder trees wrapped in Japanese Knotweed vines, which from the shriveled, wilted leaves on the Ash seem to negatively affect these trees. 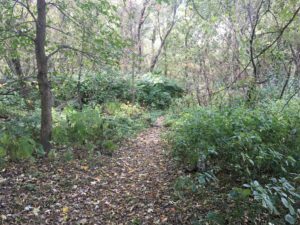 The spot I chose for my blog is within Mckenzie Park on the bank of the Winooski River. To access the spot from campus take North Prospect Street to Intervale Road and continue on the road until you reach a fork with a sign. 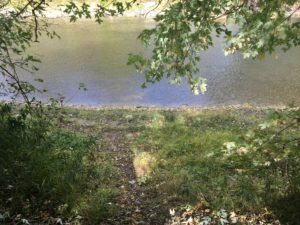 At this point continue straight and follow a rough trail along the riverbank and continue about 50-100 yards into the woods across the powerlines to a spot where there is an eroded trail down to the river. The spot was chosen because it was a scenic, peaceful spot and I wanted to explore a new forest within the city and avoid all the people who chose Centennial Woods as their blog location. 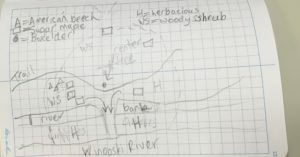 The forest composition of the spot I chose is Sugar Maple, Boxelder, and American Beech with the forest floor having a compositions of 0% Ferns, 30% Woody Shrubs with species including Hobblebush and Burdock, and 70% Herbacious with species including poison ivy and various grasses. 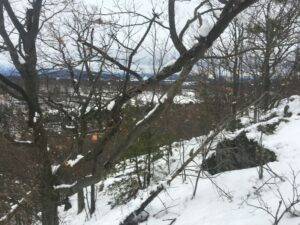 There is about a 2 meter drop from the forest area surrounding the trail down to the edge of the river with an eroded path and eroding riverbank. 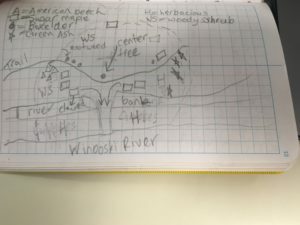 There is a large difference in land usage on both sides of the river with the side that I chose for my spot fully forested and the other side majority open cornfields with a few trees on the edge of the river. A few songbirds were heard including chickadees and there is a moderate amount of noise pollution from aircraft approaching and leaving the nearby airport. I look forward to seeing when the leaves change and how the forest floor plant composition change throughout the coming next couple weeks. © 2010 My Phenology Blog. All Rights Reserved. Greyzed Theme created by The Forge Web Creations. Powered by WordPress.